We are the leading manufacturer and supplier of a vast gamut of Nylon Cup Brush With Shaft. The offered brush is precisely fabricated using supreme grade factor inputs and the most advanced technology under the strict guidance of our quality experts. We offer this brush in numerous specializations in order to accomplish the diverse requirements of our esteemed clients. In addition to this, our clients can avail this brush at market price. 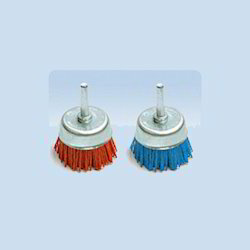 We are offering an excellent quality of Nylon Cup Brush which is designed for use in high speed air and electric tool both portable and stationary machines They are ideal for fast heavy duty cleaning of large surfaces removing weld scale rust burrs etc. Ideal for buffing, cleaning ,light deburring, flash removal surface finishing, polishing , paint & varnish removing, rest & oxide , weld preparation, weld cleaning and much more. 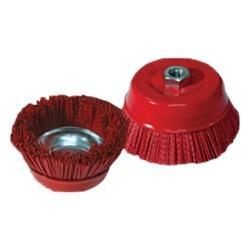 We are offering an exclusive range of Nylon Steel Cup Brush. These brushes are made up by all-straight hard steel wire or stainless steel wires suit for heavy duty use such as removal of paint, scale & corrosion of all kinds and cleaning of weld-steams & spot welds. Available to fit on portable angle grinders, large angle grinders, pneumatic grinders & bench machines.